In 2001, Jan Johansson, a well-known and respected bluegrass musician and teacher, began to put together student bands. The Kudzu Ramblers was one of those bands and is still going strong, despite the occasional change in membership. Our latest addition is Chuck Johnson, who hails from the “The Original Nashville”, in Nash County, North Carolina. Dont let his quiet demeanor fool you. When not taking a swim in the New River with his iPhone, Chuck shows off his chops on the bass and is a promising guitarist. Weve been privileged to play with Dr. Johansson as well as a host of other fine musicians, most of whom have asked we protect their identity. Seriously, Kudzu guests and members emeritus include: Michael Booze (banjo extraordinaire from “The Paris of the Piedmont”), Amber and Anthony Campbell, Matt Foster, Tom Langdon, Margaret Martin, Greg Penny and Tom Williams. If we inadvertently left someone out, we certainly didn't mean to do so. Weve been fortunate that so many musicians and vocalists are willing to share their talent with us. The Kudzus would be remiss to not mention the influence and direction of Julie Elkins, who has coaxed harmonies from various members throughout the years. 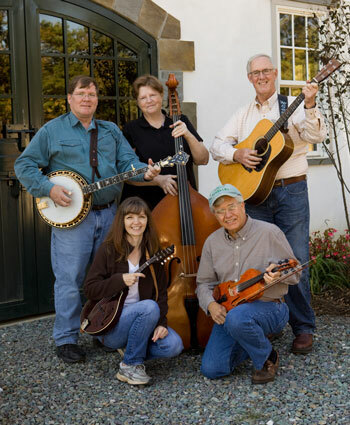 Pictured are Marty Bacon on banjo, Theresa Johansson on bass, Sid Comer on gee-tar, Carla Osborne on mandolin and Lennie Green on fiddle.